Mr hubby & I are poles apart in our choice of movie songs. I am a retro while he is a metro & loves to try out new things. I feel like an antique piece when hubby & niece discuss the latest songs. But that’s the beauty of being married. The best of both come together & we are an amazing Antakshari team. Few days ago, he called me up & was humming this song in some ‘”Uh uh uh aaaa yey” I was like “you fine?” He then said it was the latest hottest number from Race 2. He usually updates the old fashioned me however he was all praises for Jaqueline Fernandes. As the wife in me fumed inside, I hid the smoke & lovingly said “Sure baby, will check it out”. It’s the first time that I looked at a song & noticed the girl more than the guy. Hey! Before u jump on to conclusions, I’m perfectly norrrmal. But look at Saif in the song. He doesn't look normal. He needs some lessons from his new begum on looking young (he can try by throwing that cigarette) and being more stylish. Once look at the song & he is looking the oldest odd one out in the entire cast. Mr. Casting Director, poor Jackie is making so much efforts to brighten up, at least do justice to her by casting some young actor! I know u compensated for Saif’s fee by cost cutting in Jackie’s clothes. But I just loved her green mini skirt & the overall look. Overall, the song is a treat & I couldn't help but tap my feet to the amazing techno beats. Shalmali Kholgale has done full justice with her attitude waala voice & has proven her versatility after songs like Pareshaan (Ishaqzade). Full marks to the choreographer for getting the steps right with Jackie, specially the finger on the lips step which caught immediate attention of Mr. Hubby. However, Saif could have done more than just jumping on the fragile dance floor (thump, thump, thump!) & his same old blank face, trying to give the same old macho looks. 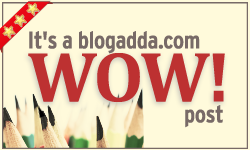 This blog received a Wow mention @ Blogadda! 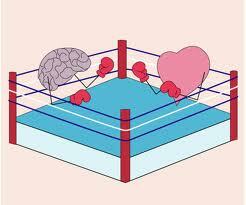 Once, the mind and heart were sitting together in a lecture. The mind was trying its best to comprehend and retain the professor’s shower of technical jargons. The heart, on the other hand was greedily looking at the iphone screen on the second bench and the game being played on it. Heart: I forgot to get my laptop, else I too would have survived the two hour session. Mind : Shhh! Can’t you see I’m trying hard to concentrate on the lecture? You better not disturb me. Heart (in a playful mood): Concentrate…ooh as if your rusting neurons & grey matter are as good as that topper sitting on the last bench. Why waste time, when you won’t remember a thing at the sight of the examination paper. No matter how much you try, you never leave your parampara (ritual) of cribbing after every exam. Chill! I have an idea. Let’s try to sleep with eyes wide open! Mind (infuriated): You wicked heart! How dare you call me inferior? If I don’t cooperate, you will go far from being a good heart to an insane one. Had I not been there, you wouldn't even remember who to love and who to hate. Imagine, what would have been your plight had I created few cross connections here & there. Heart (with a foul face): Monsieur Heart, just because you do me few favors don’t mean you run the show. Don’t forget, if I leave, nothing survives. Business is all you mean. But at the end of the day, it is I who decide whether the person is happy or sad. The professor spotted the dilated pupils & immediately popped up a question. Poor mind hastily got its act together & the heart had a hearty, wicked laugh. Two hours into the lecture, the heart had it enough. Heart: I am yawning nonstop. Can’t take it anymore. I wanna doze off. Shut up your useless activity & let me rest. Mind: You think I like all this? It is so tough for me. But what to do. 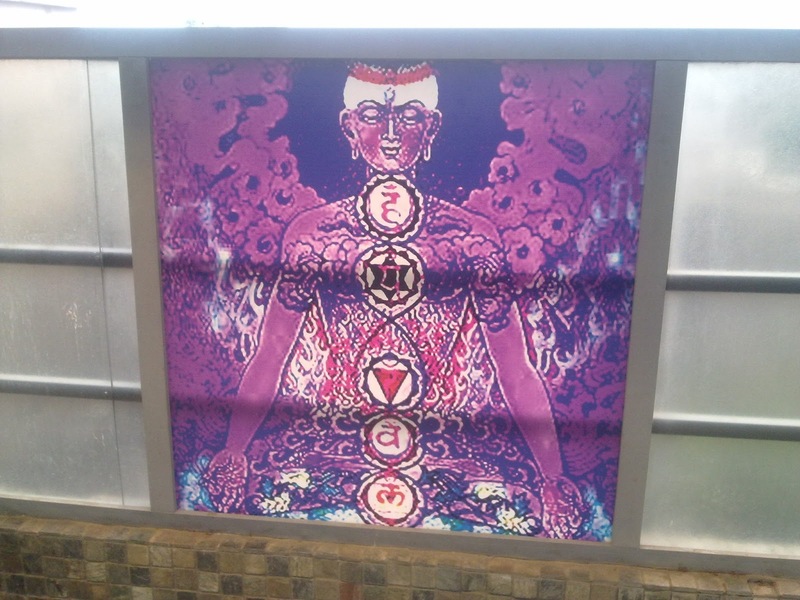 I am the mind. I don’t have the luxury of wanting & desiring like you have. I have to do what is right. Heart: But we can take a break! You are so tired my dear. Mind: I am the mind, it’s a horrible life, I can’t rest till the class is on, else I won’t have any inputs even to my subconscious memory…it's technical stuff, you won’t get it. Just stay quiet for another hour & then we can take the desired nap. Heart: Alright dear, I have no choice, can’t leave you. But I have a condition. Every 5 minutes I want an update on the minutes left for the class to be over, else I will trouble you with my useless nonsense & you can’t even ignore me else I will make you sad. 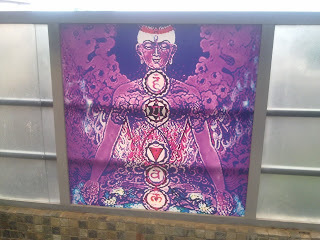 Mind: You are such a Betaal! Heart: And u are my darling king Vikramaditya! Hate me, curse me, but u can’t leave me. The mind took notes religiously for the next one hour while the heart looked here & there and waited for the next time checked. Mind: Phew! Finally….I am exhausted….who am i? A zombie? Mind: You must be very sleepy. Sorry. Lets catch up on sleep. Heart: Now that the class is over, on second thoughts…Neah! Miss Youtube is waiting for a movie date & I must look my best! Lets rush for the movie date! I have recently started seeing a surge in people wanting to face their fears. Be it the reality show “fear factor”, increasing number of people going for adventure sports, increasing focus on healing one’s life etc. "Sometimes people like to do things just to do something", I told myself. Fears are like the clouds in the sky; the shapes might change but they are never out of sight. How is it possible then to face one’s fears in the eyes specially the ones whose very mention give us goose bumps & that sinking feeling in the tummy? I was watching a famous Bollywood actress in an interview last night. 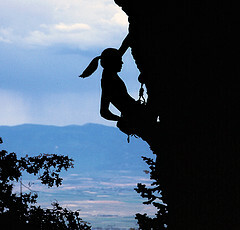 As she spoke about her constant ventures to overcome her fears, I wondered if it is too good to be true. Do people claim victory over their fears or they are just saying it aloud so that their heart can listen & remember to turn a blind eye to those fears? I am scared of a freaking lot of things in my life. Instead of bragging about my self-proclaimed triumphs over them, I prefer being honest & accepting my fears. It’s good to be human sometimes & I am definitely one. However, temptation is very wicked. So last night I had this sudden itch of overcoming my fears. They have been hovering around my grey matter all these years but to write them down & accept that they did exist & trouble me, required some guts. My brown eyes obliged many of them with ample saline water & I just let them be… Also jotted down the things I want to do in life….and I must say the list far far faaaar exceeded the list of fears. I’m a greedy gal! I donno if this will help but when mere acceptance gave me so much relaxation, I hope the journey will just get better now…I wish myself all the best for this new endeavor! Our greedy mind wants more, and there are no free lunches in this world. So we work extra, strive to succeed, get that extra share of pie. The days extend into nights and we become so busy with “just getting it right” that we forget why it all began. To be happy! And happiness no money can buy. It comes from within, triggered by the small joys of life. The grass is greener on the other side. When we are young and have the small joys at our disposal, we ask for bigger, better. And when we get that bigger, better, we realize that the innocent, sweet fruit of happiness lay hidden in those small joys we once had. As it happens with anybody at the start of his/career, I, in my first job was at my workaholic best. I would stretch to limits that would surprise my bosses, would eat, sleep and think about my job. My office began to see more of me than my family did. I would enter home just in time for dinner and doze off. 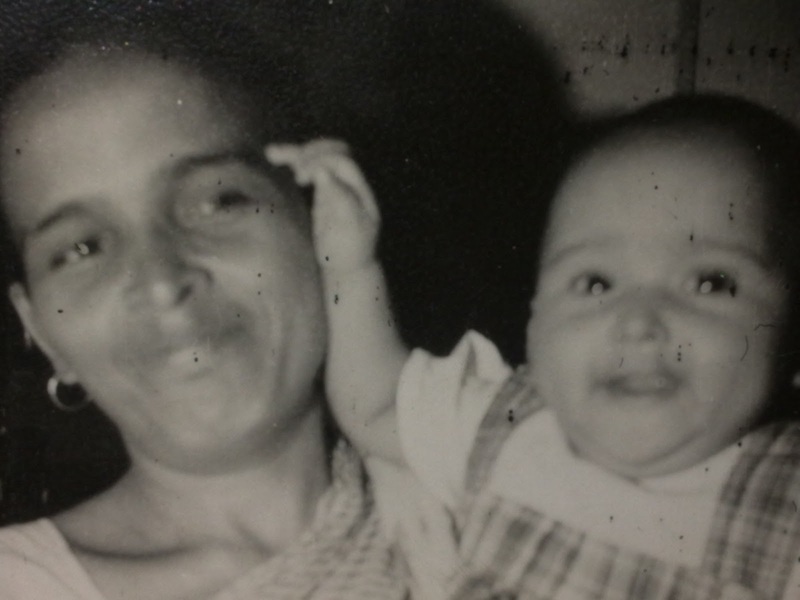 Then, one day my mother asked me “Why have you decided to work?” “So that I can be independent & do what I want”. I said. “But are you really getting time to do what you really like doing? How many books have you finished in the last 2 months?” That got me thinking. The rut of life was pulling me inside like a whirlpool, and I was not even realizing it. But when you are 20, all that seems right is big, better and beautiful & so I forgot her words the next morning & happily gave in to the busy bee syndrome. Many years have passed since this dialogue. Mom & I never spoke again about it. Now, she is no more. I am doing well for myself. But when I see myself not getting time to blog, despite my mind bubbling with ideas, I wonder what’s wrong. Everything technically right happens in life, but suddenly you find yourself hard pressed with time for the people you love and the things you love to do…the reason why it all began…and then you wonder…. As I write, I recall the scene from “Rock On” where Farhan Akhtar turns off his system just in time to be with his rock band! Whenever I read reports in newspapers about disturbance in a country, I wonder why cant the people there shift their base rather than living in fear of death and uncertainty. The world is a much open place now and anyone can go and settle in the place of his choice & live a better life. And my opinion applies to people living in extreme sub zero climates, places with forever political problems, high militancy areas etc etc. However, I am told nobody likes to leave his house…coz home is where the heart is. Even the pigeons on my hostel window reflect the same attitude. To be honest, I hate being away from home, away from the happening city, in a place everything, right from food to climate to infrastructure is in a state of despair. Yet, everyday I see a bunch of pigeons living happily on my room window. Its no easy situation for them either. The place is not an ideal destination for enough water, or food for them. Still, no matter how much I try to shoo them away, they always come back to the window. They have a free mode of transport, would need no passport/visas to shift to greener pastures & are not even bound by a residential program (like me! )…so what is it that motivates them? And then I look at migratory birds in Lodi Garden in winter mornings. Like tourists, they come every year, to survive extreme weather conditions. Yet the comfort is unable to make them stay here forever. Come the right season in their home country & they happily take the long flight back home. They say the solution to life’s puzzles lies in looking inside, so I introspect. No matter how much I love Delhi, there are people who strongly share the opposite opinion – people from other cultures finding tough to adjust here, tourists harassed by the locals, people finding the city unsafe…they have their own reasons that nobody can counter. Yet, what is it that binds me to the place? Like a migratory bird, I look forward to taking that first flight home whenever I can…because home is where u feel comfortable and secure… home is where the heart is! Exams are over tomorrow & I head home! Just like New Year resolutions are meant to be broken, my anti blogging plans always end up in the trash bin! 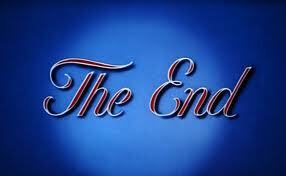 I had told myself – no blogging till the exams are over, no checking of page views. But Dil pe kisee ka zor nahi (nobody can control matters of heart)…and the heart feels like shouting it out loud on this blog! So, while he works it out in the office with some new team who is keeping him away from his wife, he doesn’t realize he has become my latest bakra for “Shaivi Ka Funda” Wow! We always long what we don’t have, get into a “do or die” situation to grab it….as if it’s the most important thing in this world. And once, we have it as ours, closed in the closet, safely. Since there is no risk of losing it now. Such is with men (I know men reading this post will abhor me, but guys, I can’t help but sound feminist, I am agitated right now). Scene 1: You see, I am not a typical chocolate, flowers loving girl. And to impress a literature freak like me, he indeed had to work hard. And his courtship period report card has been very impressive…reading out my favorite blog to me, writing poems, birthday wishes in 10 different languages, a new adjective every sms, discussing new books everyday…etc etc etc…he did it all with finesse. I used to wonder then, is there really something as an epitome of perfect gentleman? Coz he proved it every day. Once he actually stopped on the road while going to office so that he could focus on talking to me. NO work, no meeting was more important than me…and I found this too good to be true. The woman in me, Oooh…was on cloud nine! Scene 2: He wakes up in the morning but waits to be woken up officially by me, announcing tea in a particular way. And just when I am enjoying that favorite article in the Sunday paper, he orders another cup. Had I been a restaurateur, I would have loved the extra order…but my reaction is that of a clerk in a government office, when his boss throws and additional file, just when he is about to reach the new high score on solitaire! I continue to look into my paper like a pigeon who closes his eyes, but a 2:1 ratio (the hubby & mom in law v/s me) has me in the kitchen again! So, I was saying something about men. Once they know they have us, all other things take precedence on us…the boss who never gives them credit, the colleagues ready to stab in the back, the pest friend always dropping in at the wrong time, all intruders are welcome in the “us” time. All is fair with men and their work. But we women know how to juggle various hats. And then they shower the “you should have done….”gyaan…Men…Phew! 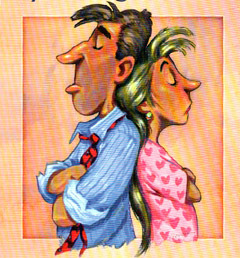 I know now you will say one has his moods, commitments, work…but where is our work when we take out time to talk to them, where is our mood when we happily listen to their stuff even if we have things piled up to do…because we women don’t believe in "get and forget!" Losses are a part of life. Material, financial, human or emotional, we all go through them sometime of the other. While some console themselves by treating losses as act of destiny, most crib, cry and question why it happened to them. And I started early as well…debates, recitation, declamation contests while still under ten. I remembered how I would never open any prize in the school and bring the unwrapped gift home to mom, ask her to present it to me like they do in award functions and then open it for me. She would take it as her win, her prize and the pride in her eyes was more precious to me than anything else. My 1st national award, then 2nd – she was there with me always, asking me to look at her in the audience if I ever felt nervous while reciting. And when people complimented me for my talent, she took more pride than I did myself! In fact, the year I passed out of college, she told me “with you, I have won so many awards, studied science, and then done hotel management. Being involved with every step of yours makes me feel as if I myself have acquired all these degrees.” Where else would you find a person who feels that way? And now, it’s an endless wait for me…. Mom became my pillar of strength. Any laurel without her is incomplete and any pain without her is incurable. Yet, she was the one who made me to be the strong woman I am today, taught me to love, share, care and most importantly, think positive and creative. Today, as I write this blog, I also realize that we should remember such angels in our lives with a smile, not tears. It’s easy to be selfish and cry on someone’s departure, considering our loss. But, it takes guts to remember the departed with a smile; acknowledge God for bringing them into your life, rather than cribbing about the loss. “The glass is half empty, but also half full” as she always said. Thanks for everything…May you continue to rest in peace, happiness, smile and radiate that positivism! Miss u mom! And love u the most! This post is written exclusively for the writing prompt by author Preeti Shenoy. Yes. We all love happiness, smile, prosperity, fun…but for us and our loved ones. What about sharing love and happiness with someone unrelated to us? Someone who’s of no benefit to us? The true test of our character is how we treat someone who can do nothing for us. We love bigger, better, best. How many times have we not frowned at seeing someone prosper? Not felt jealous of our rivals? Shared their happiness? By nature, Homo sapiens (that is we, humans) look out when its time to take but look away when its time to give. If everyone relished the joy of sharing, the world would be such a better place! Perhaps if people knew how to share pain, the unfortunate gangrape incident in Delhi wouldn’t have occurred. It’s our love for self at the cost of trouble for others that is the epicenter of all wrong doings. I wished people "shared" pain as it were their own…and my wish did come true when I saw people out on streets to seek justice for the victim! I once ordered Pizzas for friends who were to drop in to my place. The weather worsened & they cancelled their plans at the last moment. I was in a fix … to have a super heavy "Pizza" dinner or give it to my neighbor who would show this huge favor by taking leftover (she would call the sealed packet leftover!) Pizzas. Hubby & I chose the 3rd option. We took the pizzas and distributed them to the beggars on the traffic signal. As I prompted a young beggar to take away the Pizza, his eyes twinkled instantly! He ran as fast as he could to grab the pizza before anybody else took it. The happiness in his eyes gave me more happiness than 100 pizzas would have given. And I didn’t know him! Nor was I to benefit from him in any way. Yet, I tasted the joy of sharing…. We women have a new craving every hour (pani puri, chocolate, shopping, coffee, breezer, Chinese, Italian…an endless list). The Martians (i.e. Men), on the contrary are so predictable, so plain. Men have no cravings coz they get what they want. Even if they crave, they won’t show. Like a charmer, they will get their object of desire. So simple and smooth, just like their clean shaven face. When everything has to be so smooth, then why that evening stubble? Where does the penchant for smoothness go then? 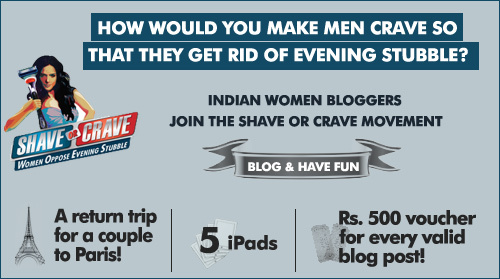 This post is a part of the "Shave or Crave" movement in association with www.blogadda.com, "The biggest community of Indian bloggers"
This post is a part of the <a href="https://apps.facebook.com/425290917524532/?fb_source=search&ref=ts&fref=ts"